Get ready to shock your lineman's socks off with this very special gift just for electric power linemen! Surprise him when he opens this spectacular NEON BLUE FLUORESCENT wall light gift! This product is made with high quality LEDs as Luminaire, which features clear soft lights, very low power consumption and long working life. It is regarded as a newer upgrade replacement for normal lighting fluorescent tube signs. 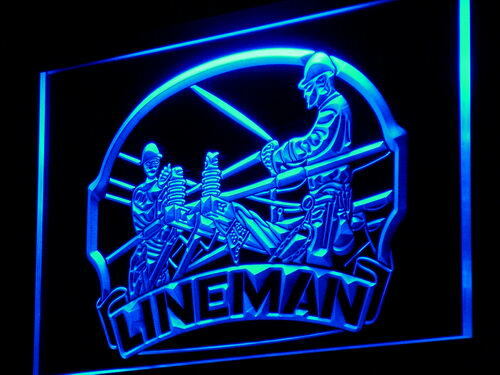 The lighted lineman signs are carved with the latest 3-Dimension, surface and line engraving technologies. Approximate size is 12" wide by 9" high. Made with the high quality clear acrylic. Plugs in to any USA or CANADA outlet. 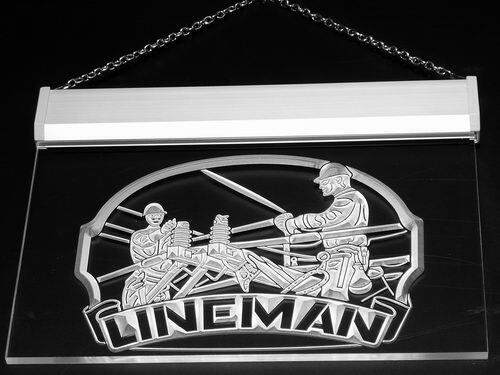 This lineman gift is unique and it will be totally unexpected!